This is our 3-up tristar, specifically made by Steve's LEDs, LLC for your specific application. It is a high quality solid aluminum MCPCB for superior thermal conductance to keep your LEDs cool. 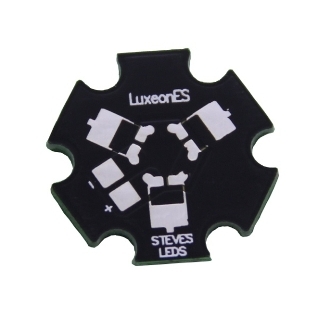 This star will allow you to have 2 or 3 Luxeon ES LEDs, your choice of color, on a single star, yet offers the efficiency of having the already wired in series - with only a single positive and negative solder pad. For LED #3, you can choose to leave the LED off, or have a jumper bridge in its place. Perfect for making your own color combination. All LEDs are controlled at once. Great if you need a lot of LEDs in a small space, such as using many royal blues for a marine aquarium, or 2X Deep Reds and 1X Royal Blue for plant grow lights.